Eating ice cream on the beach .... what a wonderful picture that conjures up in the mind. Children and adults alike love eating ice cream by the sea. Why is that? Well, let's take a look at it. Most of us go on a beach when it's sunny and warm and on a warm day an ice cream is a really welcome treat - cool and refreshing. Eating ice cream can be a bit messy. Let's face it, how many of us have never dripped an ice cream cone onto our clothes? I don't see many hands up in the air for that one! So where better to not worry about messing up your clothes than when you're on the beach - most people are in their casual clothes or swimwear so it's not a big deal to clean up any ice cream that's gone astray. 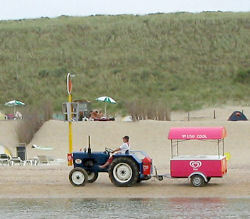 On many beaches, even on those without major facilities for buying food and drink, you can usually find an ice cream seller that comes by during the day. Sometimes on foot but very often in a small motorised ice cream cart, these ice cream sellers doing a roaring trade. Here's a photograph of one in Zandvoort where the beach stretches for miles on end, giving the ice cream seller a vast sales patch. It must be good business - look at how well organised this ice cream seller is with a tractor and beautifully attractive pink ice cream cart. Hard to resist! Zandvoort, like many other seaside resorts, is abundant with opportunities to eat ice cream off the beach as well. It has some great ice cream parlours and some of the best ice cream display cones I've ever seen. If you know of a great beach for ice cream and want to share it with others I have left this post open to comments. No junk mail please - this is a serious blog for people seriously interested in ice cream. Thank you on behalf of all the good bloggers that are out there!